ADR Manager lets you enter any number of characters for your show. 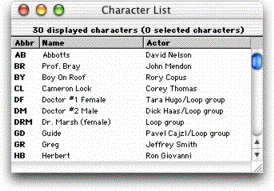 You give each character a unique abbreviation which is used to generate cue line numbers. You can also enter the actor's name (so it shows up on all reports), a description of the character (useful for secondary characters), and the estimated cues per hour that the actor can do (used in line count tables to automatically calculate how much time is needed to record an actor). You can add other information, such as what ADR stage the actor will be recorded, then use that information to create a line count table with subtotals for how much time is needed at each ADR stage. Along with storing the usual information about reels such as the dupe date, the version, and the Last Frame Of Action (LFOA), ADR Manager lets you store several versions of the same reel in one database. That means you can be recording to one dupe and at the same time be spotting or cutting to an entirely different dupe. And ADR Manager never lets you lose track of which is which by letting you create a "reel set", or snapshot of your show. 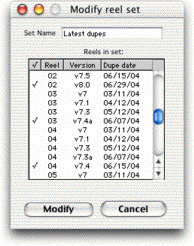 Then you can give your reel sets names such as "Version 4 dupes" or "To Be Looped". When you switch from one reel set to another, it's clear which set of dupes you're using at any given time. And don't worry - you can always do a search over all dupes in the database, if you can't find what you want in the current reel set. No ADR program would be complete without letting you enter a list of scenes. You can type in the information about each scene, or you can import a list of scenes from a variety of file formats, including a Pro Tools session text file. Once you have entered all the scenes in the continuity, you never have to type in scene numbers again - ADR Manager knows which scene a cue belongs to and automatically assigns it. And when you conform a reel to change notes, the scene continuity gets conformed automatically as well.